The house smells like ginger bread 'cause Rose is in the kitchen making ginger bread people cookies. Yum. I have been feeling the pressue that comes with this season. All the expectations that can ride up your back. I am doing my best to stall chilled out and kind of failing. I have a group show at Ann Nathan Galley next month. The opening is on the 11th Friday night. It always feels like a big deal to have a show in Chicago. I don't feel much of a connection to that city but it is fun to go out beyond Grand Rapids once in awhile. 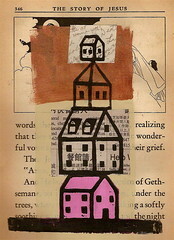 I have been in a woodblock and collage mode lately. It is a lot of fun to print on all sorts of different kinds of used paper and then piece them together and see what I can come up with. I like a certain amount of randomness and accidents. Making these prints feels like what my life is like.....lots of different odd pieces coming together in surprising ways.